Today I take a few minutes from my normal posting to mention BloggerUnite. 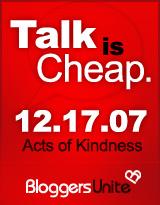 Today, December 17th 2007 is about Acts of Kindness. 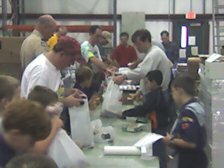 At this time of the year, I think it is a good time for everyone to spend a few minutes to take stock of things and remember those less fortunate. Normally, I do not speak of my volunteer/charity efforts but BloggerUnite is trying to be positive force so I decided to participate. 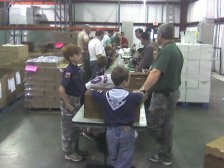 This past weekend, my Cub Scout Pack (boys in 1st – 5th grade) volunteered at the local food bank to help do whatever was needed. We worked for a 2+ hours and help box over 2200 cans of food and packed over 600 bags of groceries for needy children. I am real proud of these boys and their fathers for the time they took out from their Saturday to help others.